Will Vaping Set Off Hotel Smoke Alarms? It is a common misconception that because the vapour isn’t smoke, vaping won’t set off smoke alarms. Depending on the type of smoke detector, small amounts of vapour could indeed set alarm bells ringing. This isn’t just applicable to hotel rooms, but you could risk setting off the fire alarm in other places also. To understand better the risk of causing false alarms, we need to look at the different types and how each of the smoke detectors works. These are not seen very much anymore in crowded or sensitive areas as typically they take longer to trigger the alarm as it’s relying only on heat from a fire reaching it. You’re more likely to find a heat alarm in a kitchen than in a hotel room. Because it relies solely on heat detection, and vapour isn’t hot, it’s very unlikely that vaping even directly into a heat alarm would set it off. An optical alarm is the most likely to set off the smoke detector because of the way it detects smoke. Inside the alarm are optical light beams and when smoke, or vapour enters the alarm and breaks the beam, the alarm will sound. The issue here is that optical alarms are not specifically looking for smoke, it’s anything in the air that breaks the infrared beam. Granted you’ve got a little more leeway with vapour than you do with cigarette smoke, but it isn’t uncommon for these alarms to be triggered by vaping. It’s also worthwhile considering that hotel alarms are likely to be more sensitive than ones you’re used to having at home. Ionization smoke detectors work differently to optical alarms as they use a small amount of radioactive material which works alongside charged plates to create a current between them. The idea is that the air between them in this setup is ‘Ionized’ and a current forms between the two plates. Smoke particles break this current and specifically smoke particles, so vapour is very unlikely to set off the alarm. However, it is not completely unknown and various stories in recent years have emerged where vaping near an ionized smoke detector has indeed set it off. Some hotels have no issue at all with you vaping in the rooms, whilst others have rules where they forbid vaping entirely inside the premises, the same as smoking. 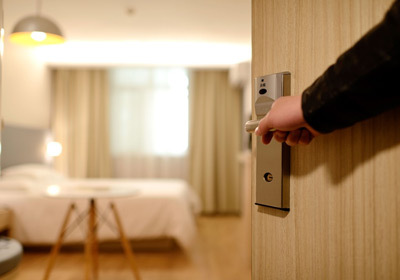 It’s best to check with the hotel directly as setting off the smoke alarm could result in a fine, or a “room cleaning fee” based on smoke detection. You can ask when you’re checking in or prior to arrival. Most hotels will also have designated smoking areas around the outside of the hotel or in an outside bar area. So, will vaping set off hotel fire alarms? Ultimately, we advise that you follow the rules of the hotel you’re staying in to ensure that you don’t run into any issues. Vaping in a room where it isn’t explicitly allowed could trigger a false fire alarm, and you don’t want to be the guest that caused a mandatory evacuation at 4am, nor risk a fine. You should also consider the type of device or e-cigarette you are using as each is different and will output a different amount of vapour.